Under The Skin tells the story of the love affair between the Nazi officer Anneliese Kohlmann and one of her female Jewish prisoners in Neuengamme concentration camp. 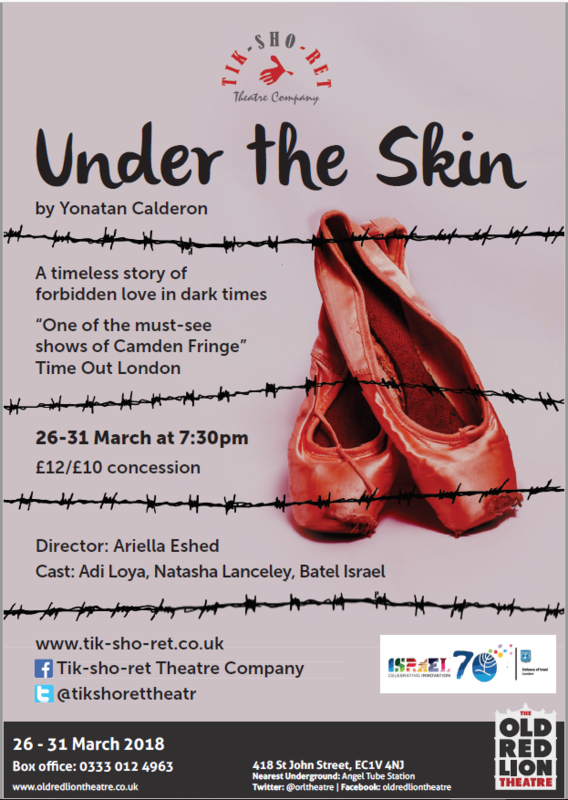 The play is based on Kohlmann’s Belsen trial protocol, and also on Holocaust survivors’ testimonies. The show, written by Israeli playwright Yonatan Calderon, had a successful Israeli production which ran for over two years in the Gay Centre Theatre in Israel. This work-in-progress presentation will be its UK debut. “The play tells one of the lesser-known stories of the Holocaust. The piece is highly relevant today as it highlights characters from both the Jewish and the Gay Communities and explores themes of loyalty and betrayal in the face of war and destruction. At the close of the Second World War, Europe was awash with people who’d lost everything. Their country. Their home. Their family. Everything but their life. The victorious Allied armies set up camps to provide aid and shelter, and the people themselves were classified as – Displaced Persons.